Avignon Decanter (P/N DC041). This decanter is made with a pewter alloy that is food safe, lea..
Bottega del Vino Calice Decanter (P/N BV09). It will decant a full magnum and its beveled rim ..
Bottega del Vino Magnum Ships Decanter (P/N BV12). Mouth-blown and hand finished, each piece f..
Ravenscroft sommelier Decanters are produced from ancient mineral deposits free of impurities. Using..
Decanter Ball Stopper (P/N 30074005). The base has been flattened to keep it from rolling. 1 3..
Eisch Dripless Captains Decanter (P/N 30172315). The perfect pour every time. The specially..
Eisch Dripless European Duck Decanter (P/N 733/1.5). This revolutionary design prevents the fo..
IL Decantino Decanting System (P/N 510586566). IL Decantino-there's nothing else like it! ..
LAtelier du Vin Developer 2 Decanter Set (P/N 95165-3). Use the Developer® 2 to perfectly ..
Lucca Decanter(P/N 150.22.00). This stunning etched decanter is hand-made from lead free cryst..
Lucca Decanter 750 ml (P/N 15807). This stunning etched decanter is hand-made from lead free crystal.. Menu Wine Breather Decanter (P/N 4680069). In less than 2 minutes, aerate and decant an entire..
Orbital Decanter (P/N 9110). The decanter's unique "V" shape design minimizes th..
Pasabahce Duck Decanter (P/N 19339). The glass is hand blown and heated up to its melting poin..
Rabbit Wine-Chilling Crystal Carafe Black (P/N 6520). Simply fill the metal core with ice wate..
Ravenscroft Crystal is the embodiment of old-world European craftsmanship and a modern understanding..
Riedel Amadeo Decanter (P/N 1756/13). Decanting old wines just a few moments before they are s..
Riedel Amadeo Noir Decanter (P/N 8756/13). Each decanter is hand-blown, extreme, unique, and s..
Riedel Apple Decanter Small (P/N 1460/13). Inspired by the fresh contours of an apple and the ..
Riedel Bliss Decanter (P/N 2009/03). The Bliss Decanter is handmade and mouth-blown of..
Riedel Cabernet Magnum Decanter (P/N 1440/26). Decanting young wine several hours before they ..
Riedel Cornetto Decanter (P/N 1977/13). Decanting old wines just a few moments before they are..
Riedel Duck Decanter (P/N 1700/14). Individually mouth-blown, each decanter varies slightly. ..
Riedel Horn Decanter (P/N 2014/02). Austria's early horse-drawn carriage mail service used..
Riedel O Decanter (P/N 1414/13). Decanting old wines just a few moments before they ar..
Riedel O Decanter Magnum (P/N 1414/26). Decanting old wines just a few moments before they are..
Riedel Swan Decanter (P/N 2007/02). 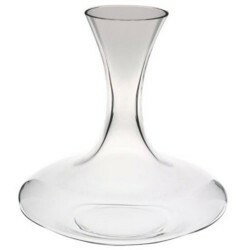 Mouth-blown of premium 24-percent leaded crystal for radia..
Riedel Ultra Magnum Decanter 70 Oz (P/N 2400/13). Decanting young wine several hours before th..
Royal Selangor Celebration Wine Decanter (P/N 014585R). Decant your wine with elegance and gra..